as usual, i had a wonderful time in new york! 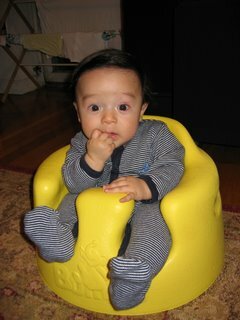 the main reason that i went was to see my friend's baby...isn't he just sooo cute?!?! i spent 5 wonderful days getting to know this wonderful little boy. he has the most amazing personality and his eyes are just incredible! it was great to see my brother and his girlfriend. after lunch, i dragged my brother out to west village to go to magnolia's and then get some shopping done! i had dinner with j on thursday night and it was great to catch up with someone from my old gap days! on friday, i had dinner with t and met her bfren, r. they took me to this great asian tapas restaurant and tea cafe! of course, m and s were great hosts. they always indulge me in all the silly things that i like to do when i'm there. oh, i finally had my first celebrity sighting...kelly ripa. she looks great, just like on television! yippee...i'm off to new york in a couple of days! i'm so excited to head back to the big apple. m had a beautiful little boy in may and i will get to hang out with him all week! i can't wait to drink my dunkin donuts coffee, eat magnolia's cupcakes, scrapbook and SHOP!